I woke up at 3.30 am today. Drove to a river. Fished all day, and ate lunch standing up in the river. Drove back. Arrived home at 8.30 pm. The sun felt warmer today, and there were more bugs emerging, which is good for the trout and is a clear sign that spring is arriving. 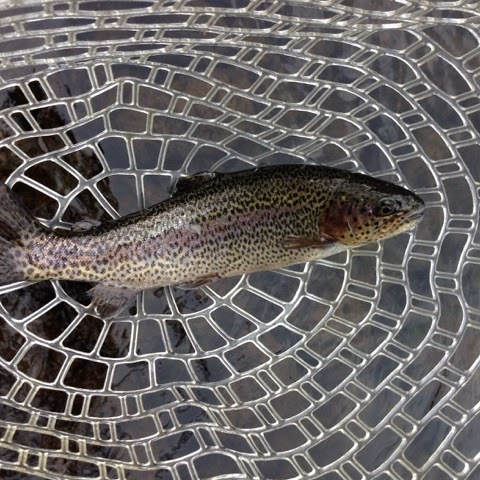 I today hooked only little fish, and landed nine of them. Below, is one. It fought valiantly, using the currents to try and get away. A joy to net and then behold. I still cannot believe that some steel, thread, and feathers tied together by hand can fool a trout. Pretty amazing.